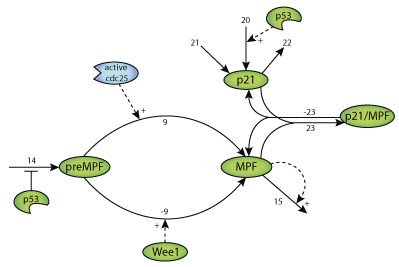 This CellML version of the models runs in PCEnv to reproduce the results shown in figure 8 of the published paper. Units have been checked and are consistent. ABSTRACT: A detailed model of the G2 DNA damage checkpoint (G2DDC) system is presented that includes complex regulatory networks of the mitotic kinase Cdc2, phosphatase Cdc25, Wee1 kinase, and damage signal transduction pathways involving Chk1 and p53. Assumptions on the kinetic equations of the G2DDC are made, and computer simulations are carried out to demonstrate how the various subsystems operate to delay or arrest cell cycle progression. 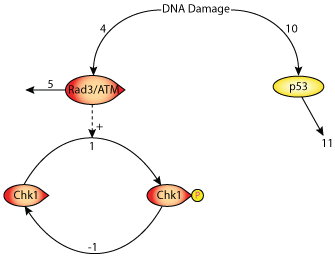 The detailed model could be used to explain various experiments relevant to G2DDC reported recently, including the nuclear export of 1433 bound Cdc25, the down-regulation of cyclin B1 expression by p53, the effect of Chk1 and p53 on Cdc25 levels, and Wee1 degradation. It also is shown that, under certain conditions, p53 is necessary to sustain a G2 arrest. 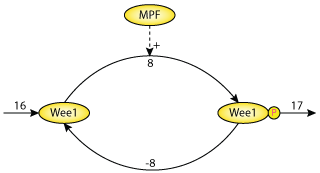 Schematic diagram of the G2DDC system showing the subsystems involving Wee1, MPF, Cdc25, and signal transduction pathways. Derived from workspace Aguda, B, 1999 at changeset 93ebfa219170.